Alyce at At Home with Books has started a weekly tradition of revisiting past reading favorites and bringing them into the spotlight. This was just the excuse I needed (but really, when do I ever need an excuse?) to gush about the book my mother would identify as my “ultimate, all-time favorite.” A Girl of the Limberlost was first published in 1909 (Happy Centennial Birthday, book! ), and though it tells the story of a turn-of-the-last-century farm girl, it contains enduring themes that ensure its relevancy and classic status in children’s literature. How did it come to be my favorite? My family didn’t know quite what to do with me as a child. I went through books too fast for it to be worth buying them, I begged my mother daily to read aloud, and I was forever asking to go to the library (I couldn’t get enough books there to satisfy my reading habit either…much like today!). Around 1991-92 my harried mother took me into the local Barnes & Noble and asked the saleslady for “something classic.” I picked the biggest (and prettiest) book presented. Lucky me, that just happened to be A Girl of the Limberlost. Mom read it aloud to my sister and I that first time, but afterwards I would faithfully read Stratton Porter’s novel to myself several times a year. I still have the same paperback copy (see photos!) and I’m fairly sure it’s a miracle that the thing even exists, with the use it’s gotten. I adore it even now, but I no longer use it as my comfort read, and other books have joined my ‘favorites’ list. It definitely has the power to make me smile and cry and remember being a bookworm of a little girl, entranced equally by the power of words and the joy of nature. Read it for yourself online (free!) here and here. Just when everything seems hopeless, Elnora hatches a plan to use the treasures of the Limberlost, the swampy forest near her home, to pay for her education. While hunting for and selling moths and other rare biological specimens, Elnora gradually uncovers the forest’s many mysteries, including a dark secret about her father and the key to the love her mother has hidden from her for so long. A wonderful turn-of-the-century novel of discovery of identity, wonders of nature, friendship, family trust, love, and the process of growing up in the magical shadow of the Limberlost. lovely sounding book. sounds like a perfect one for my daughter, a nature lover. 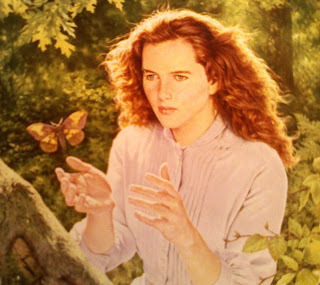 I had never heard of this book before but A Girl of the Limberlost looks interesting. Great pick! This sounds beautiful, thanks for sharing it. I'll definitely look for it. I love going back and reading these old books. This looks like a good one. Wow- don't make covers like they used to, eh? What a wonderful memory! It's such fun to reminisce about good reads from way back when. I'm so glad to find another Limberlost lover. And you have "my" cover, too. I looked everywhere for it online and couldn't find it. My copy is currently held together with rubber bands. I read this for the first time last year, and wished that I had found it as a teenager or a child because I think then I would have REALLY loved it, like, Laura Ingalls Wilder loved it, because I'm actually obsessed with her. While I really liked this book, the second half threw me for a loop. Regardless, I still really like this book. I also looked into her life and that made it even more interesting.